snowdeal.org > ex machina: the whole craptacular chinese products recalled due to high lead content mess hits a little too close to home. the whole craptacular chinese products recalled due to high lead content mess hits a little too close to home. i try my best to keep somewhat abreast of the product recalls that seems to come everyday related to products made in china, but you can imagine my surprise when i just happened to skim an toys r us recalling chinese-made crayons and noticed an almost off-hand reference to chinese-made sarge die-cast toys from the movie cars also being recalled. odin certainly loves the movie and he recently received a die-cast sarge for his birthday, but i figured they probably produced a gajillion of those things all over the place and what could the odds be that ours was possibly contaminated with lead? it turns out the odds were quite high. 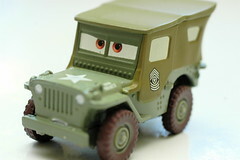 mattel has a page with recall information and how to determine a car is covered in the recall. luckily, sarge was odin's least favorite toy, he almost never played with it and he's long been out of the stick-everything-in-your-mouth phase. but still. Check out http://www.oompa.com I am loving their toys. And they aren't made in China. Yay! Lots of great wooden stuff.